food made with one special ingredient: Love. Our journey started at the sanibel island farmers market; now we want to extend our arms into this food loving community of sanibel and fill your tummies with the healthiest and highest quality food we can provide. Our “mothership bowl” and what we are known for is our Poké. What is Poké you may ask? The origin of Poké is Hawaiian, pronounced ‘po-kay,’ and is any seafood or meat cut into cubes. Along with our Poké, we offer a “Create it Your Way” selection of bowls with bases, proteins, veggies, sauces, and more! Each bowl is made quickly and efficiently with care, customized to your own taste and prepared in front of you. At Spoondrift we like to push the boundaries of food flavors and hope to bring the island new culinary selections you have yet to see. Spoondrift is dedicated to making your special events unique, fun and tasteful. Ask us about offsite catering, or renting our space for your next private party or gathering. Poke is a Hawaiian dish, but with the recent Japanese food trend (more people eat raw fish), and more affordable price for Poke bowls (less sashimi), easy quick meal for busy people, poke bowls are kind of ideal for a quick sushi fix. How do you pronounce Poke? Pronounced ‘po-kay,’ people often pronounce it ‘po-kee,’ or ‘poke,’ as in “I will poke you”. Is Poke Good for You? 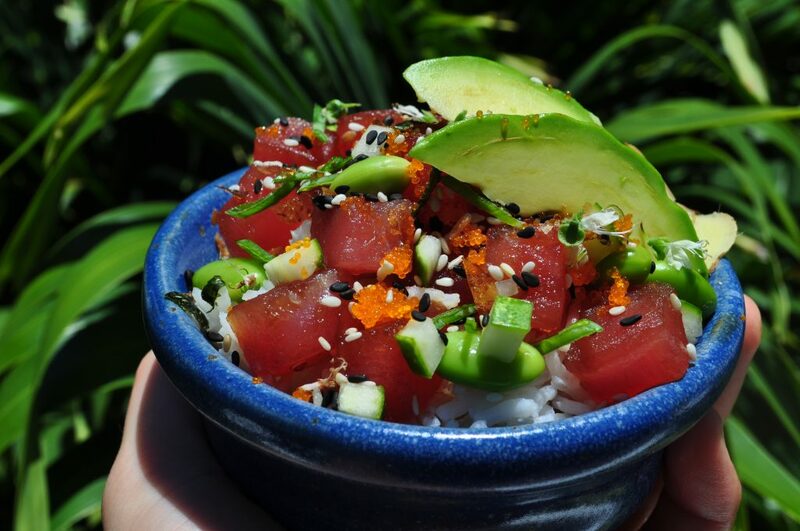 Poke is one of freshest, tastiest, healthiest new food trends around. You can consume 4 ounces of poke for just under 150 calories, only 5 grams of fat, and 24 grams of protein. Not only is it naturally low in calories, many of the veggie toppings have health benefits. Is Spoondrift part of a chain? The owners are local and live on Sanibel with their daughter Malia.